Is it really possible to access uninterrupted power supply with an MTN Sim? With MTN Mobile Electricity Service, the answer is YES! Dating back to April 2014 when MTN Nigeria signed a tripartite agreement with Nova Lumos BV and Schneider Electric to provide alternative and affordable electricity supply. I guess power supply was a bit stable then, compared to now, that’s why it is unpopular. A lot was said about it here. 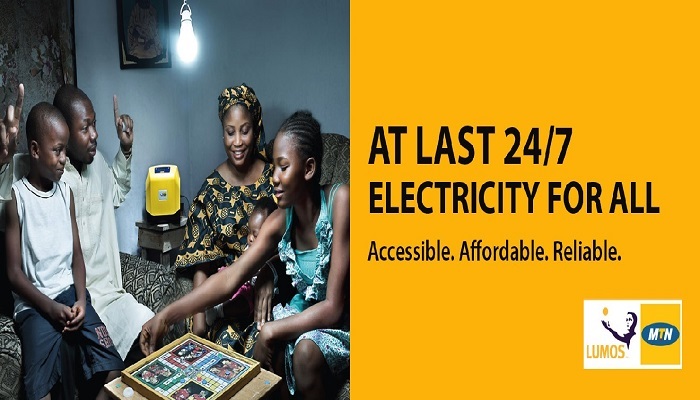 As at February 2017, a report says Nigeria’s power generation stands at 3,528 megawatts which is barely enough to service the over 1.8million citizens hence, the Minister of Power, Works & Housing, Mr. Babatunde Fashola has endorsed the launch Mobile Electricity Service by MTN. The launch which took place on Monday 20 February 2017 at the Transcorp Hilton Hotel, Abuja was also graced by Minister of Communications, Mr. Adebayo Shittu; Chairman, Senate Committee on Power, Senator Enyinnaya Abaribe; Chairman, MTN Nigeria, Dr. Paschal Dozie; United States Ambassador to Nigeria, Stuart Symington and others. What is MTN-Lumos Mobile Electricity? The Mobile Electricity Solution is an MTN SIM-enabled solar based system that will enable Nigerians to enjoy about 70watts of electricity. The energy generated is sufficient to power several household items including Fan, Radio set, Laptop Computer, Light Bulbs, TV set and Handset chargers. The purpose of the new device is to provide mobile solar electricity systems for the benefit of families and businesses in the country. The MTN-Lumos solar solution includes a large solar panel linked to an indoor storage unit that allows customers to access significant amounts of power on demand, day or night. The service is provided on a lease to own basis, and the cost is spread over a five-year term, payable in affordable payments via mobile phone from an MTN airtime account. Customers receive a full product warranty during the lease period, providing peace of mind and quality assurance. Also, to keep you always in the light, we now offer Top-up, Auto-renewal and daily fallback as options on all plans. To exit send Exit to 317 Choosing longer plans gives you the optimal value for your money! And You Can Get Top-ups For Free! MTN has also spiced things up by asking users to share their experience to get FREE light DAYS. When you refer a friend or family member to join Lumos Mobile Electricity Service, you and your friends are given bonus airtime! We will like to know your thoughts about the MTN mobile service solutions. Use the comment box below to tell us what you think. Will the power carry all the three fans in my three bedroom apartment with 5 bubs?